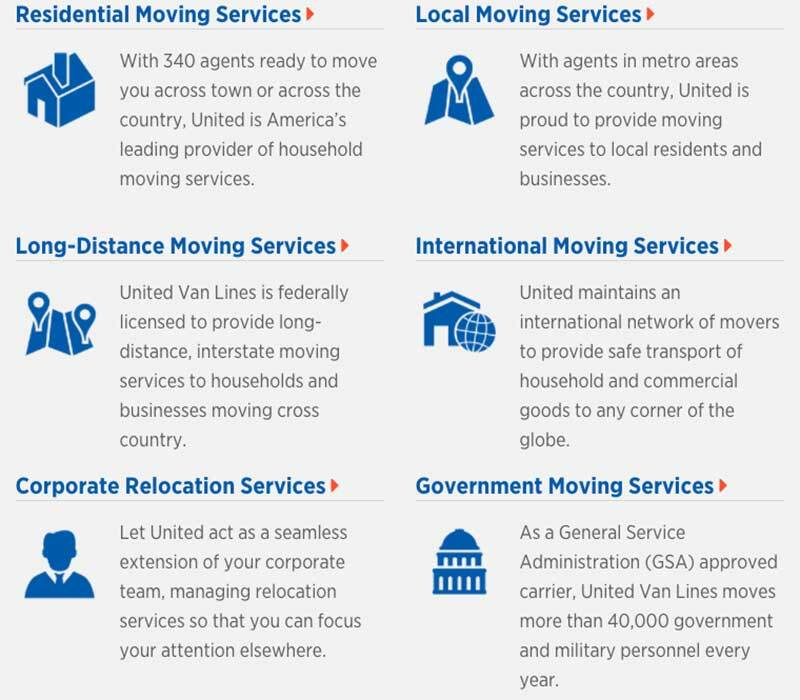 United Van Lines offers over eight types of moving services with the goal of lightening your load on your moving day. Check out our top recommendations for long-distance movers buy clicking the link below. With 90 years of in the moving business, United Van Lines has become one of the most experienced moving companies in the United States. According to the Federal Motor Carrier Safety Administration, United Van Lines’ nearly 5,000 drivers have traveled almost 135 billion miles. That experience combined with extensive knowledge about every aspect of a move is part of what has made United Van Lines one of the top-rated moving companies in the United States since 1992. 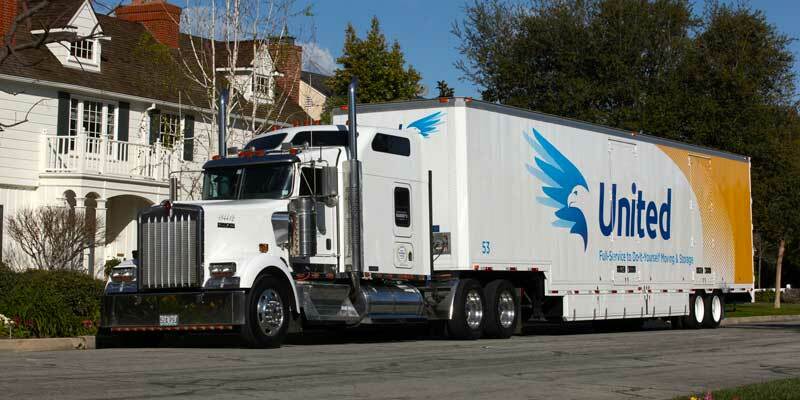 The full service moving company is one of the largest in the United States with over 7,500 trucks. The organization is made up of more than 400 independently-owned agencies that affiliate under the United banner for access to centralized support and resources. They offer moving services for local and long-distance interstate moves, international moves, and also operate a nationwide auto transport program. These additional offerings can be added to your moving contract individually or bundled in one of five packages to save you both time and money. Enter the zip codes of the originating city and the receiving city. Select the type of home (studio, apartment or house) you are currently living in. Get the estimated initial quote. We tried the quote tool on the website and received an estimated cost for a move from South Carolina to Georgia (approximately 250 miles) for a one-bedroom apartment. The estimate was $1,900 if you pack everything to $2,400 if you have United Van Lines do the packing. The quote specifies that the actual cost will vary based on different factors such as the moving dates and times, actual weight vs. the estimated weight of your belongings, total distance of the move and any unanticipated transportation and storage services. Any additional service or protection options you select such as supplemental insurance or clean up service will add to the cost of the quote. To determine how much coverage you need, see the Federal Motor Carrier Safety Administration’s tips for understanding the valuation of what you ship. 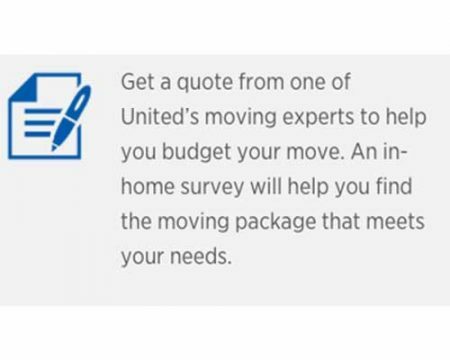 If you decide to move with United Van Lines, request a firm quote, and an agent will come to your home to survey your belongings to estimate their size and weight. The agent will then go over packing, protection and service options to help create a customized moving package that will fit your needs as well as your budget. Your final estimate includes the calculation of local, residential moving quotes according to United Van Lines’ federally-registered moving tariff. Your rate depends on a combination of mileage, weight, time-frame and any extra services you select. For interstate moves, the transportation charges depend on the actual weight of goods once your shipment is loaded onto a truck and weighed, and the distance between your old home and your destination. It’s a good idea to compare rates from multiple companies when considering any move but especially long-distance moves. United Van Lines offers international moving services to over 180 countries. Their highly trained international move team will be there every step of the way and can provide information about travel, language, customs and even culture, to prepare you for your adventure abroad. Their visa and immigration services help make sure that your paperwork is all in order and their family relocation assistance is top notch. United offers options, pet transportation and school assistance where a liaison helps you find the best schools in your new location. Settling-in services include area orientations, utility connections and finding the right bank. United Van Lines’ customers run the gambit from love to very dissatisfied, mostly depending on the local agent company used for the move. Those in the love category frequently use words like “excellent,” “professional,” “courteous” and “friendly” to describe the agents, coordinators, and movers. For those with less favorable experiences, stories of late deliveries and miscommunications seem to be at the forefront. Some customers have reported that procedures, such as the color coding system used on boxes, vary between agents making it difficult to know which room your boxes should go into at the destination. Burke, an independent research company, monitors customer satisfaction surveys filed on United Van Lines. Their overall customer satisfaction rating is 4.22 out of 5 stars based on 20,078 customer surveys completed in the last 12 months. Better Business Bureau gives an A+ rating to UniGroup, Inc., the parent company of United Van Lines, with a composite score of 3.68 out of 5 stars. American Moving & Storage Association awarded United Van Lines with a Fleet Safety Award, which recognizes overall safety, improvement in safety, and creativity and leadership in safety program design, in the Over 50 Million Miles category. Yelp shows 1.5 stars with 56 reviews. To their credit, a United Van Lines agent responded to roughly 9 out of 10 negative reviews asking for direct contact so they can resolve the issues reported. When should I schedule my visual survey and in-home estimate? Ideally, these steps should be taken no less than eight weeks before your move. When should I start packing for an interstate move? Determine what items you will dispose of five weeks before you move, then start packing boxes no later than three weeks before moving day to give yourself plenty of time to get prepared. Is there anything I should not pack for my move? Hazardous or perishable items such as aerosol cans, ammunition, cleaning solvents, fertilizer and fuels/oils can’t be boxed up and shipped with your load. If you aren’t sure if something falls into either category, talk to a representative. If there is any loss or damage to my belongings, how long do I have to file a claim? After delivery, by law, you have nine months to report any problems to the moving company and file a written claim. The mover then has 30 days to acknowledge receipt of your complaint and within 120 days of receiving it, they must either make an offer to pay your claim or deny it. Once in my new home, what is the first room I should unpack? United Van Lines suggests that you start unpacking in the kitchen to make sure that you can eat the first night in your new home. However, if you need rest more than dinner after your move, start with the bedroom and bathroom. United Van Lines offers more services than any other moving company we have found, and their nearly 100-year history means they have a significant amount of experience in the industry. They can handle any size move to almost any location in a professional manner. Do not use them. This was our 10 corporate move so we are no strangers to moving. We had one disaster after another. They crack our big screen tv, our 2 year old refrigerator came filled with mold and all tracks were rusted. Some of our things were not wrapped, we received a box of smelly trash which was not ours. We have never in all the times had so many things broken to the tune of 4000$$ dollars plus the refrigerator 4500$ and a 1200$ TV. Customer Service has been horrible. I have had to contact they over and over to get reimbursement which I have done but it was a full time job dealing with these people. Worst experience ever! We moved to Tx by them and was way under the weight allowed but when moved back our weight somehow doubled according to them. We even moved some of the stuff in a Uhaul ourselves so they really over charged us because we had to pay out of pocket for the overage. Then I told them we had only added a few things and he said you moved x Amount of boxes there and it was like 4 times more boxes moving back. I have opened several boxes and some only have like a hat in them or just a few items. I even opened one that had an empty box of mine in it. I mean really people. So watch closely and they dropped our mattress off the Trk here and while loading I heard them drop something down the stairs and when I ask them the smiles and said they didn’t. Of course most didnt speak English. Grrrr!!! If we are told a large Amy of weight this time then we will hire our own movers. Ridiculous. WOW! JUST WOW!!!! My family and I have moved 5 times in the last 11 years. All of these times we have used various moving companies. Our fist experience 11 years ago was with United Van Lines. It was outstanding and everything just shy of being perfect. Since that time we used many other companies as a result of the concern for cost. All of those experiences were decent but pretty much mediocre. This last move was from West Palm Beach to San Antonio. We paid $10K out of our own pocket to have United to move us. They were not the cheapest but our first experience was such a positive one that we wanted to have that same experience again. The packing experience was a JOKE! We were sent 2 packers for a 5 bedroom home (3700+sq ft) that was short on the actual packing supplies and had to have one of the packers leave early in the day to get more and they STILL ran out! After 8pm they simply threw items in boxes without any sort of padding or wrapping. I cannot even tell you how many items were damaged in the move. As items came off the truck we saw item after item damaged. The final straw was when we noticed my husband's MV Agusta damaged. This is a showpiece motorcycle that he had shipped directly from Italy (it's only 1 of 57 in the entire US). We immediately called to let them know that we would have to be putting a claim in on this move (which we have NEVER done in all of our years of moving). We followed every single detail we were told to do to ensure the claim was handled properly. We were told it would take 3-4 weeks to have the claim resolved once it was submitted. We submitted everything on our end June of 2018. Here it is the week of Thanksgiving and we are just getting it settled. That might sound great, however, they have not only denied items (which we expected to some degree) but they are only paying for 1 item that was damaged on the motorcycle. I was SPECIFICALLY told to break down all of the items on the motorcycle since this was such a unique and specialty item and they would handle it as a separate claim even though it was all in the same original claim. NOW I'M BEING TOLD THAT IT WASN'T TO BE BROKEN DOWN AND WAS CONSIDERED TO BE ONE ITEM?!?!?! How is that my fault that I followed your orders??? If I want this resolved I will have to take it to arbitration in order to get the additional couple grand that they destroyed out of my bike and how ever many months this will all take to resolve!!! Trust me - this isn't over! I'm not just rolling over. Arbitration is definitely worth it for all of the hassle and headache they have put me and my family through. We were insured for 80K yet they can't fork over what they screwed up? We are the ones to suffer and we are the ones that will now have to come up with the funds to fix THEIR mistakes and mishandling. And yes, we have pics and documentations for everything so this is by no means fabricated. We will NEVER use United again and I would advise you to do the same!!! Mergenthaler-United Van Lines (UVL) loaded our belongings on 7/3/17 in Cascade, MT, to be delivered to our storage unit in Aransas Pass, TX in July 2018. On 7/14/17 South Texas Movers-United Van Lines (UVL) (out of Corpus Christi, TX) offloaded our belongings into our storage unit in Aransas Pass, TX. It was a very hot day, and of the four "movers", only one was employed full-time by UVL - the other three were day workers who had never worked for a moving company. Even though we had painstakingly marked fragile and delicate items, the men paid no attention to any of the markings. If we had not been present, they would have stacked multiple boxes of heavy items (i.e., books, etc.) on top of boxes with delicate items (i.e., mounted birds, wood carvings, etc.). The stacked very heavy boxes on top of small wardboxes, causing them lower boxes to collapse over time. We were horrified at how carelessly they handled our possessions, and the haphazard way they "stacked" our furniture and belongings in the storage unit. They were very unprofessional, at best. Due to Hurricane Harvey, which did tremendous damage to our new community of Aransas Pass, TX, the house we were having built took much longer to complete than we had ever imagined. Therefore, we were not able to comply with the 9-month damage reporting requirement of UVL, as we were not able to see the damages until everything was moved into our new house in June 2018. When we were able to do so, we sent a very detailed damage claim with photos to UVL, which was immediately denied, even though it was clear there was significant damages caused by their representatives negligence in handling our possessions. If you are looking for a moving company that will get the things you care about to your new home in good condition - LOOK SOMEWHERE ELSE! We chose United because they offered a "binding estimate" which was sold as something written in stone. Turns out it's not. With a “binding” contract, there are several ways the price can go up. The operations manager of the moving company can decide at the last minute that the van will not be able to park in front of your house, because the road is too narrow, too busy or some other reason. In that case you have to pay for a shuttle van. When the sales rep came out to our house to make the estimate, he determined that our road was wide enough for the van, which was true because we’d moved into the house with the van parked on the road. However, the day before the packers were coming, the sales rep told me that the operations manager had determined, just by looking at Google maps, that our road was too narrow and that it would cost $1200 for the shuttle. I tried in vain to contact the operations manager. Fortunately the packers sent word back that the road was fine, so we didn’t have to pay for the shuttle. So get it in writing that you won’t need a shuttle before you sign the contract. The contract gives you a 5-day time frame in which the van will arrive. The fine print says that the company is required to deliver your goods with “reasonable dispatch.” The definition of “reasonable dispatch” in their literature is the 5-day time frame, but this is a blatant lie. I called the federal agency that oversees moving vans, and the legal definition is 21 business days, which is 30 calendar days! Our van showed up 10 calendar days late. This left us in an empty house with a dog for 10 days. Fortunately we have kind neighbors who loaned us stuff, so we were OK. Your contract gives you $100 per diem, but motels and food cost much more than that. Plan for the worst. Have a contingency plan, pack accordingly and don’t plan anything that can't be cancelled for the month after the van is supposed to come. Most of our goods arrived safely, but several pieces of nice furniture were damaged. The movers wrapped them in blankets but didn’t secure the blankets. When you’re talking with the sales rep, ask her about how furniture is wrapped. Some movers use a huge Saran-like wrap to secure the blankets. Make sure you oversee the movers when they're loading the furniture. Brooks Transfer and Storage is the local affiliate of United Van Lines in Virginia. We used them because of their gloriously long history in the Commonwealth, our realtor's recommendations, and their staff's assurances that we'd have a good move. It was anything BUT good. The move was understaffed (in packing, loading, and unloading), the truck was too small to fit our shipment in it, but somehow they managed to over-stuff it, which resulted many high-dollar and irreplaceable items being damaged, destroyed, dirtied and lost. We paid-up for full replacement value insurance, but the settlement they offered us is not even close to the real costs of making us whole. Retiring to Florida after 40 years in one place was stressful enough, but United and Brooks Transfer made it an even worse nightmare. We wouldn't even recommend them to somebody we don't like! Truck drivers literally THREW my boxes marked fragile off the back of the van on to the street. I yelled at them to stop but it was too late. I did call and complain to the truck owner (?) or whatever role he played but it did no good. Many pieces of glassware were broken and some were not replaceable. I'd never use this company again. I WAS a customer. If there was a rating below 1 star I would have given it that one. The stuff showed up early Sunday morning five days late (24 days after they picked it up), meaning I had to get up early on a Sunday ruining my sleep for the whole week only to find a broken dish and FOUR boxes missing, including my expensive clothes. And they have no answer as to where my stuff is. And my $100 dollars a day compensation ends with the incomplete shipment AND I was told the earliest I will have an update as to where my stuff is is Thursday (today is Monday). So if this is the No. 1 moving company in the country, I suggest no one leave their things in the hands of ANY moving company. So yes, what I am saying is, they deliver our stuff late, they deliver it incomplete and I receive nothing but a message to wait some more. Unreal. This nightmare is never going to end.